After playing with such drive and intensity on Wednesday against Juventus, I think we all expected a better showing. But the truth is, the Marassi is cursed, and we haven’t gotten a win there in five years. Tonight was no different. And to make matters worse, coming off a spectacular upset of Juventus last week, Sampdoria truly had our number. Almost shot for shot (we had 14 with 5 on goal, they had 12 with 5 on goal,) foul for foul (12 each,) we had 605 possession, but nothing more to indicate that we were in 7th on the table to their 14th. The match started off lively enough, trading shots, but Sampdoria had much better chances. Like Poli’s shot in the 8th minute forcing Abbiati to tip it over. Or Eder’s shot in the 12th forcing Abbiati into another great save. Abbiati was the Man of the Match, his saves kept Sampdoria off the board for 90 minutes. Boateng continued his tradition of kicking balls directly at defender’s legs in the 23rd. Doesn’t he realize that lost it’s popularity at about age 6? In the 25th, a bit of a worry, as Ambrosini came off for a reported calf injury. Apparently it is an injury he had been carrying, in fact he was nearly not available for this match because of it. He’d done well in warmup, but knew better than to tempt fate, so Flamini came on for him. 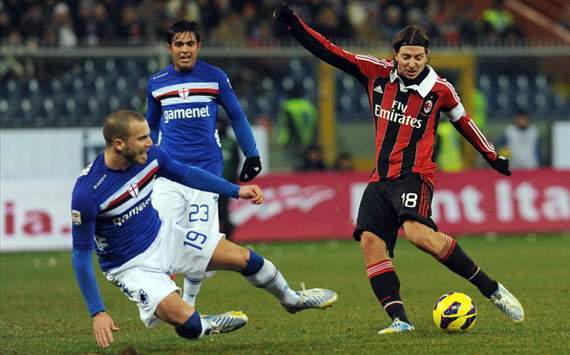 The captain’s armband went to Montolivo. Why? I will never know. How does a team like this with such a history of success and proud tradition show such indifference for the tradition of the armband? That same level of respect for the players who carried those teams to victory time and time again is simply thrown out for Berlusconi’s newest plaything? The armband should have been Abbiati’s. This dressing room nonsense has gotten completely out of control. Speaking of Montolivo, he did get a shot off from distance n the 33rd, but it was wide. And the only other notable event of the first half was Mexes earning a yellow for yanking a Sampdoria player’s shirt and throwing him to ground. Sometimes it seems like he really wants that token yellow, he’s simply not satisfied without it. Niang opened up the second half with a shot across the goal, then followed it up with some full-on facepalm sky jousting in the 56th. In the 62nd, De Sciglio sent in a nice cross to Bojan, who tried a shot, and Boateng tried sending it in, but to no avail. Probably one of our best chances, two different players unable to convert. In the 66th, Robinho came on for El Shaarawy, who was admittedly ineffective on the night. But it’s not as if Robinho was an improvement, and he didn’t bring anything to help his teammates, either. 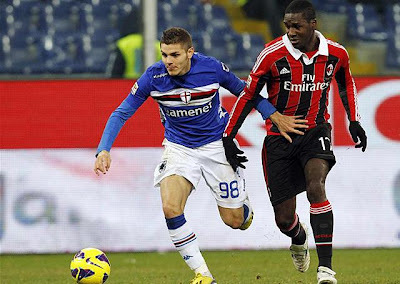 Niang was hurt in the 71st, and Allegri was yelling at him and pulling him up like an unsympathetic father. So Niang got up, and two minutes later, earned himself a yellow card. Bojan, who had taken a beating the entire match, was finally subbed off in the 88th for Nocerino, who was unable to take advantage of the final few minutes to make any impact. As a last ditch attempt, Boateng took a shot in the 93rd, which was one of our best opportunities, but it was wide. Of course. 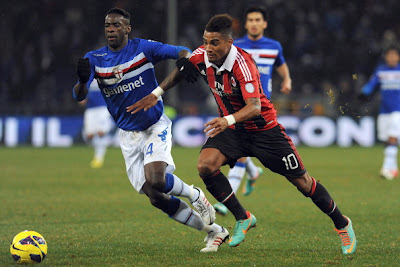 Wow, Boateng moved so fast here, his hair moved.... maybe. Are you asleep yet just reading about this? It was one of those matches. Not even the occasion of Yepes' birthday could inspire them. It started off looking like it was going somewhere, but quickly waned, and slowly, tortuously lulled us to sleep. When I said on Wednesday that this team would provide us with more lethargic performances, I really didn’t plan on it being so soon. But until Allegri learns from his lessons, we’ll probably see many more. For example, he finally started both Niang and Bojan… did he have much of an option? Boateng is an epic fail up front, breaking all stat records for the most shots without converting. And Robinho wasn’t fit yet, according to him. And Pazzini was suspended, too. So it’s not like this was intentional. Bojan’s best position was in a 4-2-3-1 as the trequartista. Time and time again, we have seen that he is not a true center forward. When I first saw the lineup, I wondered why Niang wasn’t in the center, but what do I know? What does anyone know, except for Allegri? Clearly, the man just does not seem to learn from past mistakes.